My summer ended with a two week stay at Squaw Valley, located about half way between Lake Tahoe and Donner Lake in Northern California. I try to get there in August as often as I can so I can get in some training in cold water at high altitude. 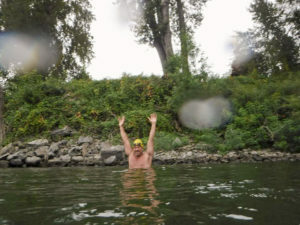 That has been my strategy for several years, getting my ancient body ready for the annual Cross Channel Swim in Hood River. 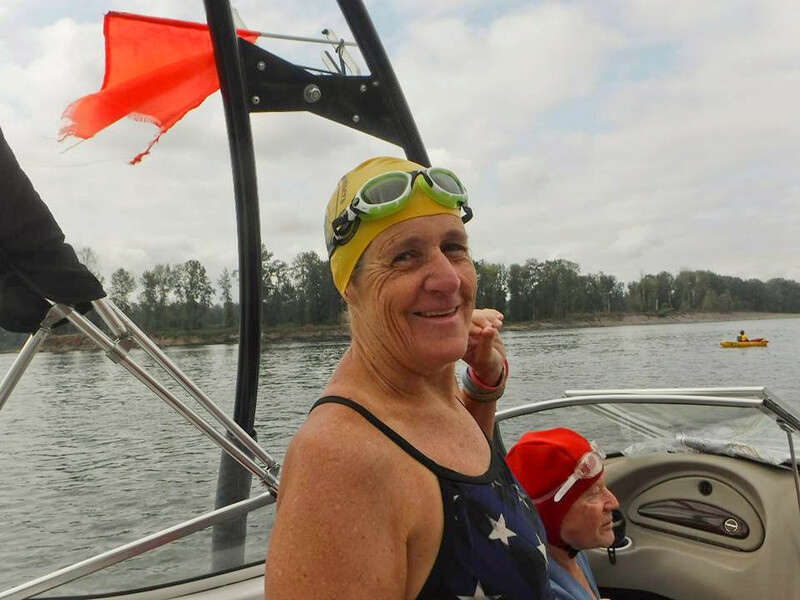 This year, 2017, I had another event to train for: A few friends were coming up from San Francisco to do a benefit relay swim to support Columbia River Keeper. 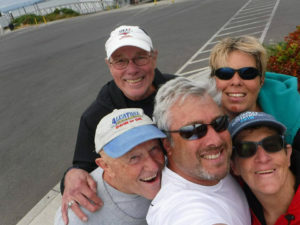 The plan was to have two six person teams, one team from SF and the other composed of Oregon swimmers, swimming a 26 mile marathon through the Columbia Gorge, down the majestic Columbia River to Portland. 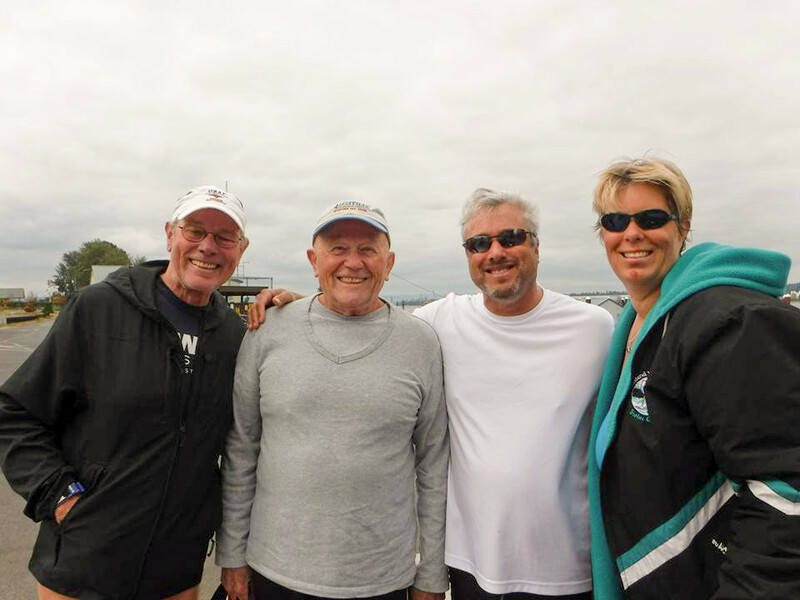 The entry fee was a donation to the Columbia River Keeper, an organization dedicated to the health of our magnificent river. My time in the mountains was great. During my very first work-out in Lake Tahoe, I was 200 meters into my swim when a huge flock of 100 Canada geese landed in the water, settling in on both sides of me. Big Papa Goose was a few meters in front, inspecting me, this curious thing in the water with his family. 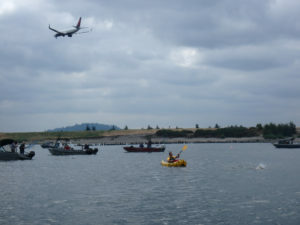 Now, I am not afraid of one goose, but when there are a hundred of them with me in the water, caution is called for. What was I to do? I do not speak Goose. The only sensible thing to do was to put my head down and keep swimming. That seemed to mollify Papa Goose, and the flock parted for me as I swam right through them. It could have been a gauntlet or a guard of honor. I took it as a good omen. And a good omen it was, although I never saw the geese again. Some days I swam along the north bank of Donner Lake (three miles west of where the Donner Party suffered that horrible winter). Other days found me swimming from Commons Beach, Tahoe City, on the north end of Lake Tahoe. Some days I hiked in the forest. 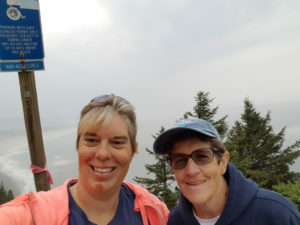 At first, for several days I felt the effect of the 6,000-7,000 feet of altitude, and I kept my swims gentle, resting often to catch my breath. It usually takes four or five days for my bone marrow to produce the added red blood cells that make training at altitude easier. After those first days, the work-outs were joyful, and I had the satisfaction of knowing that my training was going well. Then it was time to come home to Oregon for the Labor Day Swim. I was ready. When we drove to Hood River on Sunday we were greeted by air that was barely breathable, the result of growing fires in the mountains above. 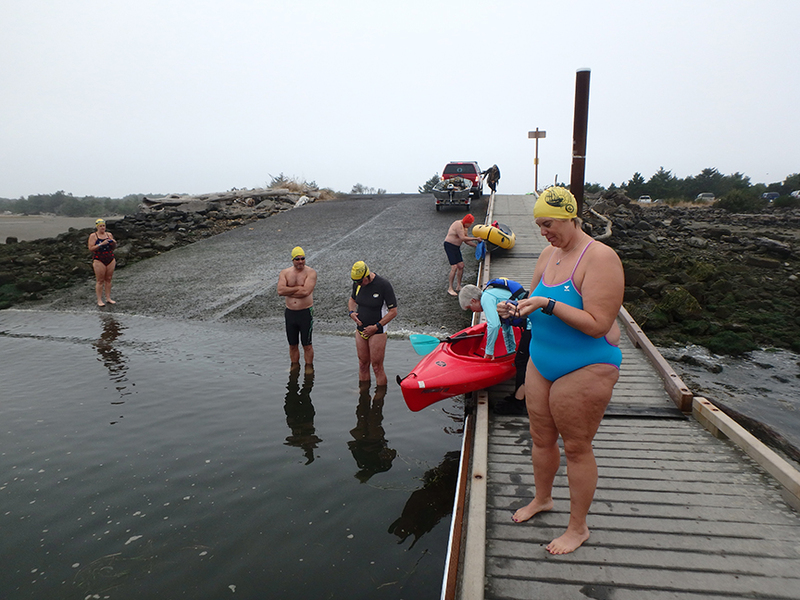 We were advised that the Labor Day swim had been cancelled and that we should go home. Our hotel generously said that there would be no cancellation charge. 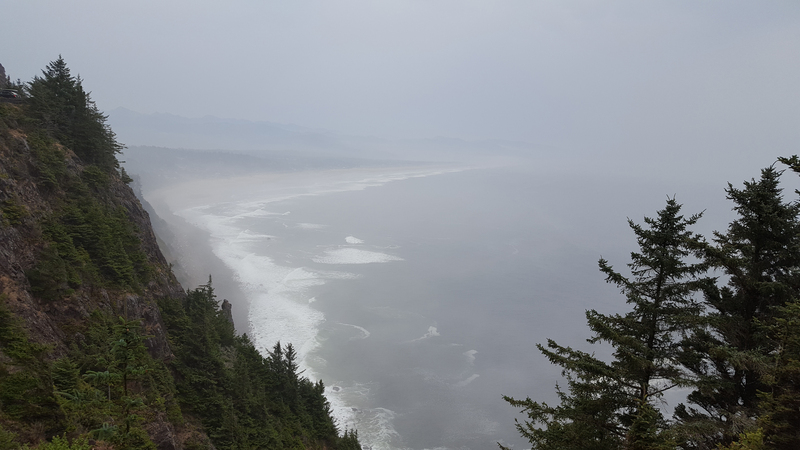 The smoke was so bad that it was not possible to enjoy the wonderful views of our Columbia River Gorge. From Highway I-84 the Washington side of the Columbia was obscured by a curtain of smoke. Was I bummed out? Sure, but it is, what it is. Mother Nature can be fickle at times. It was still Sunday and I decided to find a place to swim. 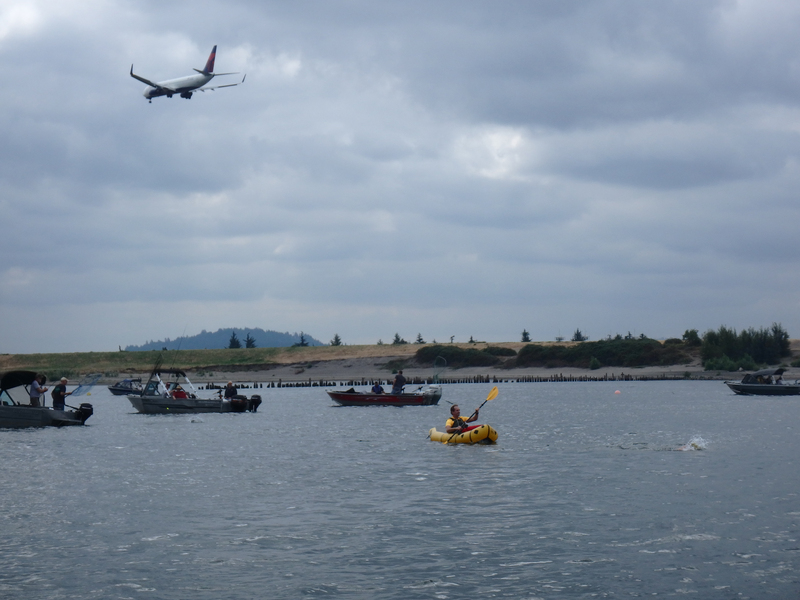 Behind PDX along Marine Drive is a nice beach along the Columbia, Broughton Beach. When we got there (Whoops, a hot Labor Day weekend at the beach?) there were tents and blankets all over the beach, but aside from a handful of waders, no one was actually swimming. No one but me, that is. 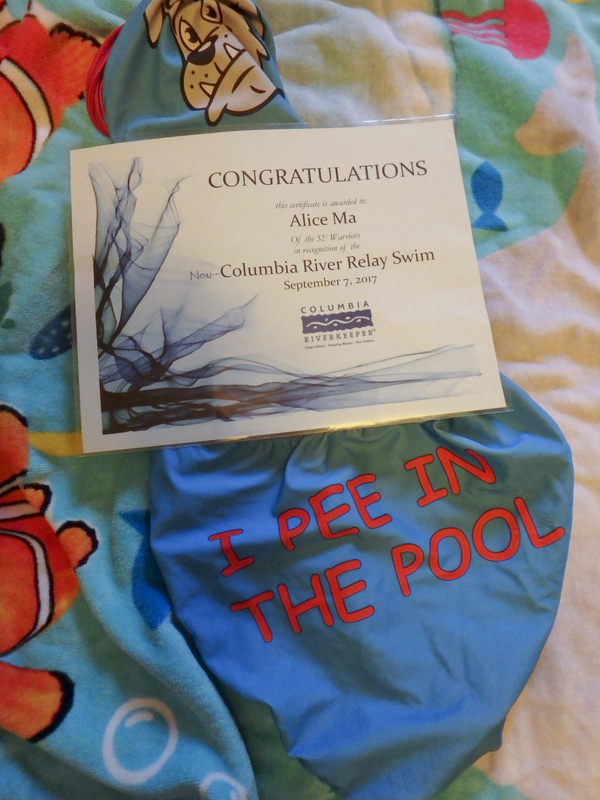 I put in about 1,000 yards, gratified my interior swim addict and left the water feeling a whole lot better. 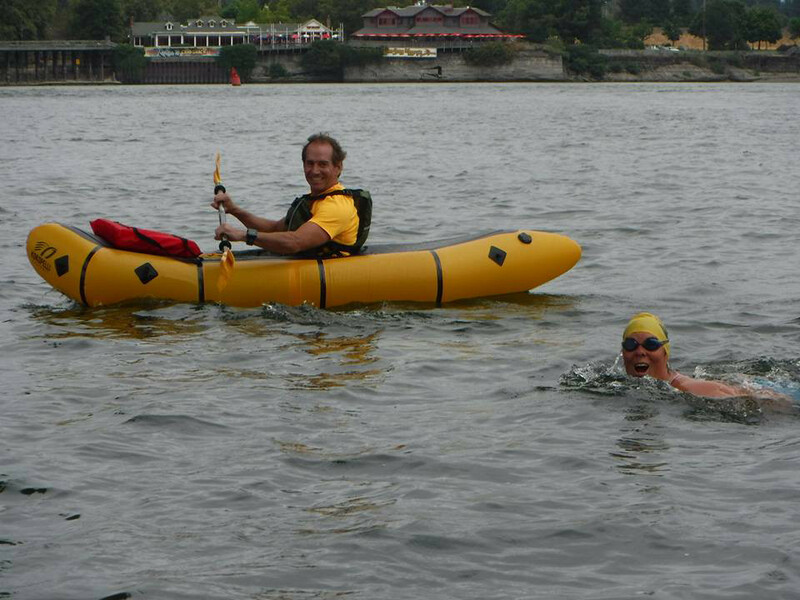 So the Labor Day Swim got cancelled, but in three days the big relay was coming up. I looked forward to that as a big consolation. 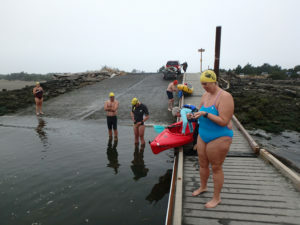 Four swimmers had flown from San Francisco for the relay, rented cars and took rooms at the Red Lion Inn on Hayden Island. Then the fires got worse, much worse. Hood River and Cascade Locks were in trouble. The air was foul. The Multnomah County Sherriff advised us that river traffic on the Columbia River was halted. 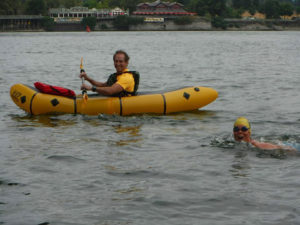 I emailed the Oregon team that the marathon relay swim was cancelled, and they all agreed that it was not possible to swim. 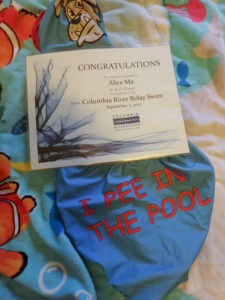 But what was I to do with the four swimmers who had spent so much money in anticipation of swimming here? Here is what we did, and frankly, it all worked out wonderfully. On September 7 we piled into two cars and headed for Nehalem Bay. We had two kayaks to accompany us as we swam INTO a strong incoming current in 55 degree water. Have you ever gone backwards while trying to swim forward? The five of us lasted between 15 and 40 minutes (I was not on the high end.) Then we drove down to Tillamook for lunch and their great ice cream, and back to Portland via Route 6. 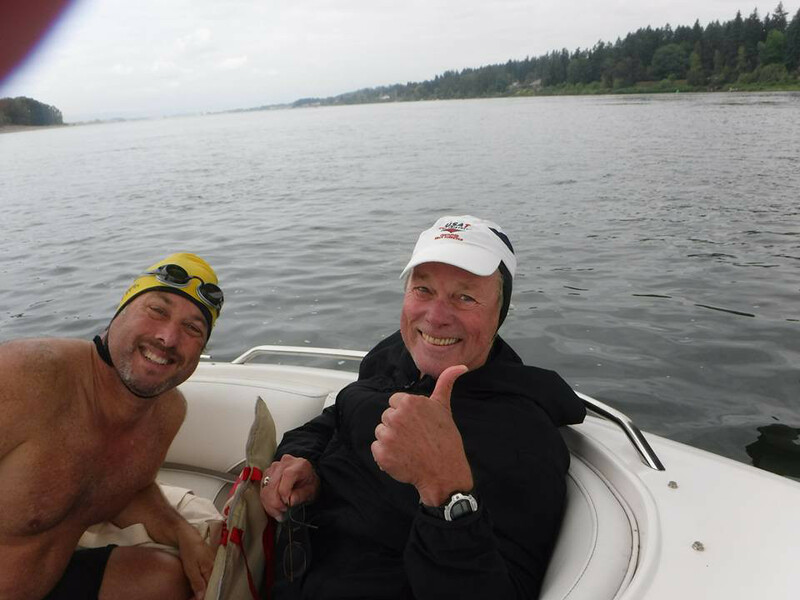 Gary Emich had made award certificates for all of us, “The Columbia River Marathon Relay Swim.” But it never happened as planned, so he added the word, “NON” in front of the other words. There is a saying that “S..t happens.” True enough, but sometimes the lemonade that results is much sweeter than what you had planned. And our SF friends went home as happy as clams. 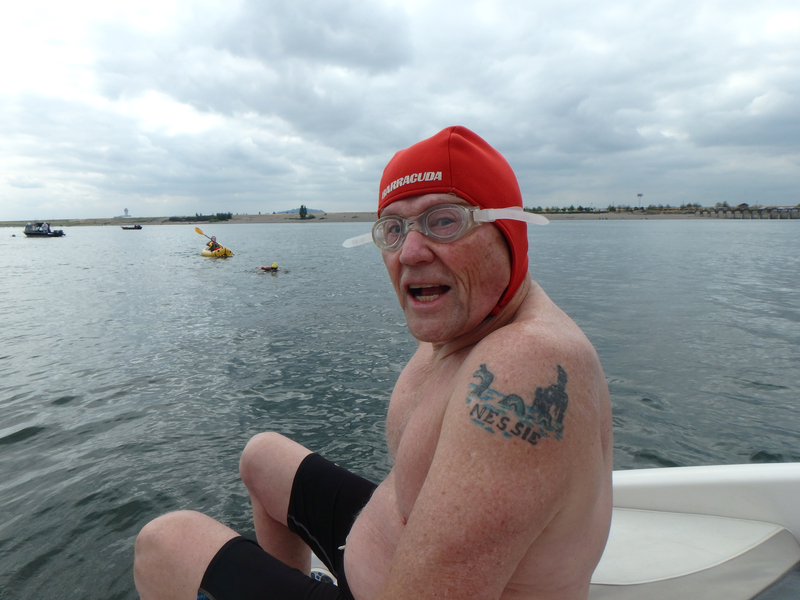 Joe Oakes getting ready to enter the water for his relay hand-off.